Silk screen printed “Bismillah” symbol adorns the front. The card has floral self-print all over. Inserts are of diminishing size. 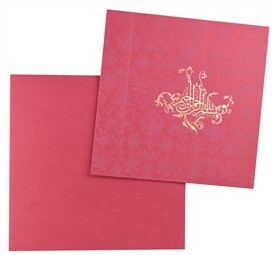 Inserts are beautified with floral border at right side. A beautiful wedding invitation! 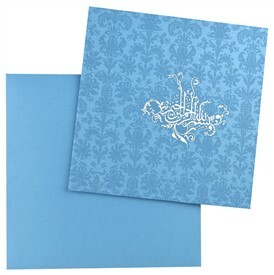 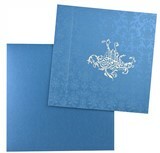 Turquoise blue shimmer paper (250 gsm) for main card and envelope. 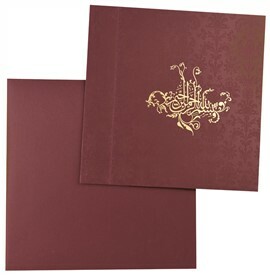 White shimmer paper (250 gsm) for 2 inserts. 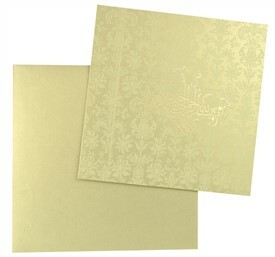 White vellum paper (80 gsm) for 2 interleaves.